Perhaps no other field of science and medicine has undergone such phenomenal change as the area of neuroscience. It was once believed that the adult brain did not develop new neurons and was a static tissue (unless it experienced some sort of trauma). Brain plasticity in adults has now been clearly demonstrated and shown to be a key factor in learning and in mental illness (such as depression). Another growing area of research is in the field of neuroimmunity: the merger of studies on the immune system and how this system affects brain function, learning, perception, and brain deterioration. Dr. Schwartz uses an enjoyable merging of detailed scientific explanation with personal encounters that both clarify the main issues and bring out the human aspects of these problems. Anecdotes show how conversation and experiences with students and colleagues could raise challenging scientific questions that led to significant discoveries in this burgeoning field of research. The primary thesis of this book is that the brain and immune system closely interact with one another, and this interaction can be essential to healthy function of the brain throughout life. A brief review cannot hope to summarize adequately the detailed arguments that lead to this conclusion, but a couple of examples may illustrate some of the thinking. Spinal cord injuries produce inflammation and scarring, as do injuries in other parts of the body. Reasoning from the example of a skinned knee which “scabs over” and then heals, the question was raised as to why the same process could not be involved in healing spinal cord injuries. Instead of the out-of-control development of scarring and tissue damage, the researchers sought to develop techniques that would regulate the healing process by involving different immune cells at different phases in the healing. Questions about cognitive differences in women who were pregnant as compared to women who were not pregnant led to exploration of changes in immune function during this time, changes associated with maintaining a safe environment for the child in the womb and avoiding immune rejection of this “foreign” tissue. Another major area of research lies in a better understanding of neurodegenerative disorders such as Alzheimer’s and Parkinson’s diseases. In many of these disorders, there is a decreased ability by the brain to recruit immune cells. The hope is that providing different immune cells at critical times will help reverse the brain deterioration that is so often seen. The work is amply documented (over 60 pages) with both detailed notes on each chapter as well as a comprehensive bibliography for those wishing to explore the pertinent technical literature further. 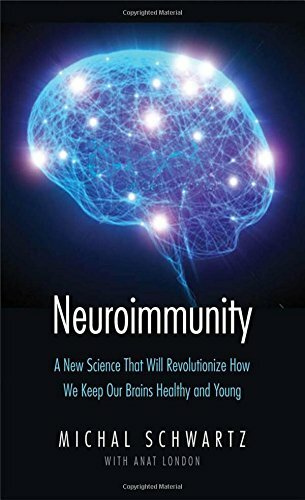 Neuroimmunity combines the personal and professional in an enjoyable fashion to show both the complexities of brain-immune system interactions as well as provide insights into the thinking of a pioneering scientist.